Marie Hecart and Myself de Breve. Photo © Sportfot. Wellington, FL – January 31, 2015 – France’s Marie Hecart and Myself de Breve were the winners in Saturday night’s $372,000 FEI World Cup™ Grand Prix CSI-W 5*, presented by Fidelity Investments®, at the 2015 Winter Equestrian Festival. Earning her first five-star victory as well as her first major Saturday night win in Wellington, Hecart topped a roster of major competition, including Olympic gold medalists Ben Maher (GBR) and Eric Lamaze (CAN). Maher was second with Diva II; Lamaze finished third aboard Fine Lady 5. Held under the bright lights of the International Arena at the Palm Beach International Equestrian Center (PBIEC), Saturday’s class featured 45 starters with 10 clear rounds over the course set by Guilherme Jorge of Brazil. In the jump-off, only two were able to clear the short course without fault. Sixth to go in the second round, Marie Hecart and Myself de Breve produced the first double clear in the winning time of 38.61 seconds. Kent Farrington (USA) and Amalaya Investments’ Willow immediately followed with a faster time of 36.79 seconds, but had a defeating rail at the last fence to finish fourth. Ben Maher and Tatiana Korsakova’s Diva II came one round later to produce the second clear in a time of 40.55 seconds. Last to go, Eric Lamaze and Artisan Farms LLC’s Fine Lady 5 completed the fastest round of the night in 36.54 seconds, but dropped one rail to finish third. Myself de Breve is a 15-year-old Selle Francais mare by Quidam de Revel x Grand Veneur. One of the smallest horses in the class at just over 15 hands, what “Myself” (or “Mini Me” in the barn) lacks in height, she makes up for in heart. Hecart has had the mare since she was four years old and has developed a great partnership over the years. With his second place finish, Ben Maher was happy with a great result aboard his mount Diva II and was pleased to see the mare in good form for the night’s class after a good end to the 2014 season. Eric Lamaze has been on excellent form with numerous wins in the beginning of the WEF circuit, including wins in all four rounds of the Ruby et Violette WEF Challenge Cup Series. The last two wins were back-to-back with Fine Lady 5. With all of his latest wins, Lamaze was not disappointed with a third place finish. The Winter Equestrian Festival has some of the toughest competition in the world with many of the top horses and riders competing, and Lamaze and Maher each spoke to the addition of four five-star weeks this year. On Saturday morning Kate Eagleton, from Miami, FL, took home first place in the Taylor Harris Insurance Services (THIS) Children’s Medal 15-17. Eagleton earned a score of 85 in the first round with Catherine Cech’s horse, My Mr. Darcy, on her way to topping the field of 20 competitors. After the first round was complete the riders with the top four scores came back for a work-off. Eagleton went into the work-off with the top score and remained consistent to finish as the winner. Second place honors went to Raleigh Hiler, who received a first round score of 82. Isabella Usenza ended the day in third place and Phoebe Alwine rounded out the top four. “This is my first time winning a Taylor Harris [Children’s Medal] so I was really excited!” Eagleton exclaimed after the final results were announced. At the beginning of the WEF circuit Eagleton was unsure if she was going to be able to show after her own horse was injured. Eagleton is thankful that My Mr. Darcy was available as a two-week substitute. “He [My Mr. Darcy] is very simple. He helps me out when I don’t know what to do,” Eagleton said about her new horse. Even with the success that Eagleton has had with My Mr. Darcy, she is excited to have her own horse back in the show ring. When Eagleton’s horse is ready they will compete in the 3’6″ equitation medals as well as the THIS Children’s Medal. Eagleton hopes to qualify for THIS National Children’s Medal Finals, held at Capital Challenge Horse Show in the fall, as well as qualify for their ASPCA Maclay Regional. Eagleton is currently a senior in high school and makes the commute to Wellington to compete on weekends. Along with balancing a busy riding and commuting schedule, Eagleton is a part of her high school’s yearbook staff. Week four of the 2015 Winter Equestrian Festival, sponsored by Fidelity Investments®, concludes on Sunday with the $85,000 Suncast® 1.50m Championship Classic featured in the International Arena at PBIEC. The Camping World Adult Amateur Hunter 50 & Over Section B will award championship honors in the E. R. Mische Grand Hunter Ring. For full results and more information, please visit www.pbiec.com. Marie Hecart and Lalique took the first place finish during the $24,750 Ridge at Wellington Invitational Grand Prix Finale at Deeridge Farm. Photo By: Rebecca Walton/Phelps Media Group. Wellington, FL – March 23, 2013 – The morning fog cleared from the grass field at Deeridge Farm, welcoming Level 2 Jumpers to the $24,750 Ridge at Wellington Invitational Grand Prix Finale. After 10 weeks of heated competition, the $175,000 series came to a conclusion today, seeing 54 entrants tackle the 1.40m course. It was Marie Hecart who wore a target on her back throughout the competition, securing the win with a double-clear effort in a mere 37.206 seconds with Lalique. It was a battle of the best today in the series finale as top riders, amateurs and juniors contended for the $24,750 purse, and it was not going to be an easy feat. Eric Hasbrouck designed today’s track, using 13 obstacles to test horse and rider alike. The course included a triple-bar, bending lines and both a double and triple combination. For those who were able to keep all rails intact, they were rewarded with the even more challenging jump-off. Only 14 of the 54 entries were able to pilot their mounts to double-clear efforts. They first tackled the opening single vertical, moving over the triple bar set on the outside, and then made a sharp right turn to a skinny vertical that could make or break the time accrued. Riders then had to move forward over an orange and yellow vertical down the diagonal and make a hard right rollback to the oxer-vertical double combination. The penultimate obstacle was a yellow oxer that saw many rails fall, and then riders took a red-and-white vertical to trip the timers and seal their fate. Hillary Simpson was only the second rider of the day, utilizing the open in gate policy to her advantage with an early morning start time. Her early start set the pace for all of the other riders, with Simpson leaving the farm as the morning’s trailblazer with a double-clear effort aboard Nopus du gue Joubert, owned by Quiet Hill Farm. Although Alexandra Thorton posted the second double-clear effort of the day only two rounds later with Quiletto du Domane, it was Sarah Segal who would pave the way. Segal laid down a seemingly effortless first round aboard Ladonna, owned by Kathleen Kamine, and moved into the jump-off without fear. She piloted the 8-year-old mount to a blazing double-clear effort, breaking the beam in 37.235 seconds. It seemed as though her lead of nearly four seconds was insurmountable, until Marie Hecart came into the picture. Aboard Lalique, owned by the Normandie Collection, Hecart soared over the first round in an outstanding time of only 82 seconds, clearly well ahead of the time allowed of 91 seconds. It was the jump-off that had the other riders on the edge of their seats. Hecart managed to stop the clock 2/100ths of a second ahead of Segal. Segal attempted to best Hecart aboard her second mount of the class, Tilghman, owned by Horatio St. Ventures, but an unfortunate rail in the jump off sealed her second place finish. She did, however, post the fastest jump-off time of the day, finishing in only 36.601 seconds with heartbreak over the final vertical as the rail dropped. Andrew Bourns and Gatsby secured the third place finish with a double-clear effort in 37.622 seconds, while Lorenzo de Luca and Zoe II rode to the fourth place ribbon. Lauren Crooks eventually took the fifth place award with Navare D’Oriolles, and Kalvin Dobbs and Winde rounded out the top six. The 2013 Winter Circuit has been riveting with exciting new jumper action lying outside of the Palm Beach International Equestrian Center in Wellington, FL. The Ridge at Wellington’s $175,000 1.40m Invitational Grand Prix Series has complemented the Winter Equestrian Festival for 10 weeks, offering a variety of venues for Level 2 Jumpers as they hone their skills as riders, and those of their young horses. This season has also hosted a number of historical landmarks for Wellington, not only opening the gates to the illustrious Mida Farms and newly renovated “Tops Field,” but also hosting competition at the beautiful Deeridge Farm. The brainchild of George D’Ambrosio and Nona Garson, the $175,000 Ridge at Wellington 1.40m Invitational Series has welcomed top professionals, amateurs and juniors alike to take their turn at the chance to win the weekly $15,000 1.40m Grand Prix. The pilot series has hosted large numbers of entries each week, boasting low entry fees, high prize money and top-of-the-line courses for participating riders. After 10 weeks of competition, the series has found its niche in Wellington, complementing the Winter Equestrian Festival, and the show managers guarantee its return for the 2014 season. The Ridge at Wellington would like to thank all of its fantastic sponsors and hosts for their 1.40 Invitational Grand Prix Series. 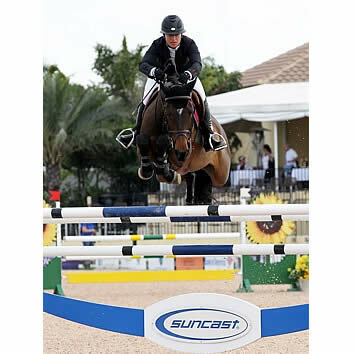 Wellington, FL – January 22, 2012 – The second week of the FTI Consulting Winter Equestrian Festival came to a close today, and competition in the International Arena was fierce with the $25,000 Suncast 1.50m Championship Jumper Classic. Marie Hecart (FRA) was the fastest clear round in the jump-off on Ecurie Michel Hecart’s Oceane de Nantuel. Second place went to last week’s 1.50m winners, Nick Skelton (GBR) and Beverley Widdowson’s Unique. Yann Candele (CAN) and Lansdowne, owned by Susan Grange, were third. The second week of the FTI WEF is sponsored by Wellington Equestrian Realty. The third week, sponsored by Horseware Ireland, runs from January 25-29. The 2012 FTI Winter Equestrian Festival has 12 weeks of competition that conclude on April 1, 2012, and they will be awarding more than $6 million in prize money through the circuit.